The Antiquities Authority on Thursday unearthed for the first time a small 2,000-year-old cistern near the Western Wall that connects an archeological find with the famine that occurred during the Roman siege of Jerusalem during that era. The cistern – found near Robinson’s Arch in a drainage channel from the Shiloah Pool in the City of David – contained three intact cooking pots and a small ceramic oil lamp. According to Eli Shukron, the excavations director for the Antiquities Authority, the discovery is unprecedented. The Jerusalem Post story continues with Josephus’ description of the last desperate days of the Roman siege. The story is also reported by Arutz-7, and the Israel Antiquities Authority press release includes high-res photos (direct link). A 3-minute video shows the discovery with audio in Hebrew. Photographs by Vladimir Naykhin/Israel Antiquities Authority. At first glance, our picture of the week looks like a peaceful, pleasant Mediterranean beach. However, there is more here than meets the eye. This is the site of a famous battle waged by Alexander the Great, and the place still bears the marks of Alexander's army. In fact before 332 B.C., this beach didn't even exist. Tyre alone opposed Alexander. The Tyrians initially offered submission and tribute to him, thinking they would thereby gain substantial freedom, as they had before. But when they saw that Alexander intended personally to occupy the city, they determined to resist. Hope of Tyrian success in withstanding the siege was not unfounded. Their city was located on an island a half mile from shore; the current in the channel which separated it from land was swift. Their fleet controlled the sea. The city wall on the landside rose to 150 feet. There were assurances of help from Carthage and elsewhere. But Alexander devised unexpected tactics. He resolved to construct a causeway 200 feet wide out to the island, on which he could plant his siege engines. Ruins of mainland Tyre furnished material for the causeway. The Tyrians fought heroically. They destroyed the engines of war by fire-ships and damaged the mole, or causeway. They hurled pots of burning naphtha, sulfur, and red-hot sand from catapults. Seeing that the battle could not be won without the use of a fleet, Alexander obtained contingents from Sidon, Greek allies, and Cyprus. After a siege of seven months, the wall was breached and the city taken after savage fighting. Our picture of the week was taken by A.D. Riddle, and is available in Volume 8 of the Pictorial Library of Bible Lands. This photo and over 700 others are available here for $34 (with free shipping). Additional photos and information about Tyre can be found here on the BiblePlaces website, and here on LifeintheHolyLand.com. The quote above was taken from The Wycliffe Historical Geography of Bible Lands by Charles F. Pfeiffer and Howard F. Vos (Chicago: Moody Press, 1967), 210-211. Thus ends the story of Sheba ... but not of Abel-beth-maacah. The city is mentioned two other times in the Bible. One occurrence is in the story of the war between King Asa of Judah and King Baasha of Israel (1 Kgs. 15:16-22). During the struggle, Asa is able to convince Israel's northern neighbor, King Ben-Hadad I of Damascus, to attack Israel's northern territories to draw Baasha away from his southern borders (1 Kgs. 15:20). Abel-beth-maacah and the neighboring city of Ijon are specifically mentioned. The other occurrence is similar, although it records events that happened about 150 years later. In 2 Kings 15:29, Tiglath-pileser III of Assyria begins to conquer Israel by taking over its northern regions. Again, Abel-beth-maacah and Ijon are specifically mentioned. Being situated on Israel's northern border meant that you were first in line when an invading army showed up. As I have mentioned before, one of the most valuable aspects of the Pictorial Library of the Bible Lands is that it includes places and things that are not normally included in a collection of biblical places. Abel-beth-maacah is a case in point. So the next time this site comes up in your OT Survey class or your Sunday School lesson or sermon preparation, you need not be content showing where Abel-beth-maacah is on a map but can also include a couple of pictures to give your listeners a feel for the place. 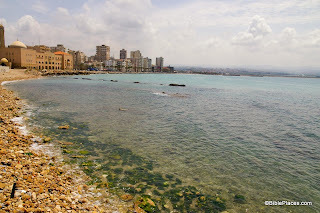 One final note: As I was writing this post, I was pleased to learn that a major excavation project at Abel-beth-maacah is starting this summer. Information about the dig and several additional photos of the site are available at www.abel-beth-maacah.org. They also have a Facebook page available here, and a blog here. The photo above and over 1,100 others are available in Volume 1 of the Pictorial Library of the Bible Lands, and is available here for $39 with free shipping. 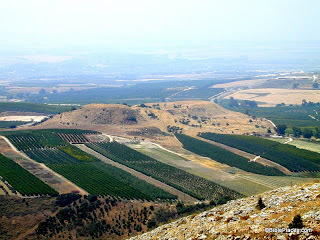 Photos and information of neighboring locations are available here, here, and here on the BiblePlaces website, and here and here on LifeintheHolyLand.com. 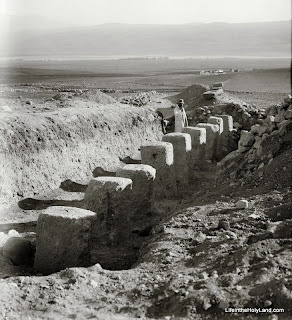 The excavation season is upon us (as has been made clear through the recent roundup posts here, here and here), so our photo of the week is a picture of some early excavations at a well known site. Can you guess which site it is? This photograph was taken sometime between 1928 and 1946. This dig was carried out by John Garstang. The Arabic name for this site is Tell el-Qedah. A row of matching pillars was found only a few yards away. The valley in the background is the Huleh Valley. This building was later fully excavated by Yigael Yadin, and eventually was moved to a different place on the tell by Amnon Ben-Tor. The answer to our riddle (and a picture of the whole structure) can be found here. 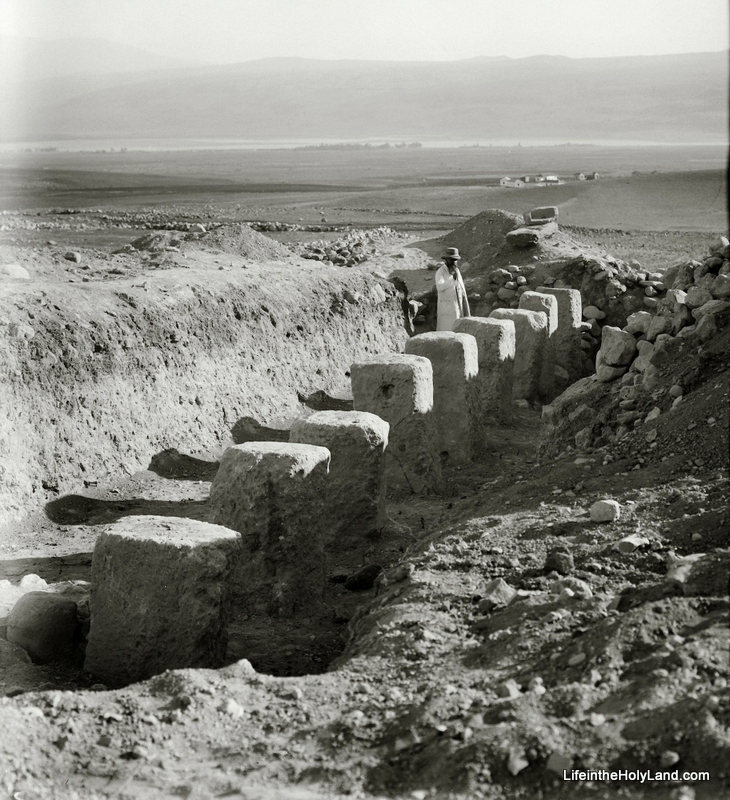 During a sounding at this site in 1928, Garstang found one of the rows of pillars in a Israelite tripartite pillared building. This type of structure was common in the ninth and eighth centuries B.C. and has been found at Megiddo, Hazor, Beersheba, and elsewhere in Palestine. The function of these buildings has been debated, with some scholars interpreting them as stables and others interpreting them as storehouses. The last I checked, the proponents of the "stable" interpretation had the upper hand ... but the readers of this blog are welcome to start the debate again in the comments section. And for all of you who are in the field this summer ... Happy Digging! May you be as fortunate as Garstang was in his brief sounding at Tell el-Qedah in 1928. This photo and about 600 others are available in Volume 1 of the American Colony and Eric Matson Collection, and can be purchased here for $20 (plus free shipping). Additional images of this site can be seen here on BiblePlaces.com. Additional images of the Huleh Valley in the 1800s and early 1900s can be seen here on LifeintheHolyLand.com. The eleventh season at Khirbet el-Maqatir has concluded with word of a spectacular find that cannot yet be revealed. The team excavated several Roman-period silos, a first-century ritual bath, and an Iron Age house. The season at Tel Burna is coming along nicely. The First Week Wrap-up provides an overview of the known stratigraphic sequence of the site. The report for days 6-7 include a photo of a large monolith and a beautiful Iron IIB pavement. John Black shows how archaeological work in Jerusalem has undermined historical criticism of the Gospel of John. A Picasso drawing is being raffled to raise money to preserve the archaeological remains of Tyre. The Egyptian Museum in Cairo was recently closed to tourists by striking employees. Barry Britnell shows with photos why the Cilician Gates are important for Paul’s journeys. Douglas Petrovich provides a summary of his recent article that serves as a “John the Baptist” role for his forthcoming book, Evidence of Israelites in Egypt from Joseph’s Time until the Exodus. Ken Dark recently lectured at the University of Edinburgh on the archaeology of Nazareth and the Plain of Gennesaret (Ginosar). Summaries of these lectures are available online. 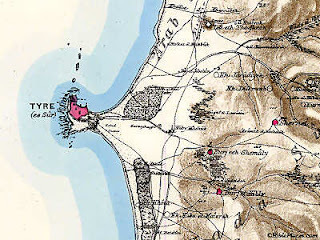 While I find highly dubious his suggestion that there was “no road between Nazareth and Sepphoris”—what sort of physical evidence would you expect to find for a road from an agricultural village of a few hundred people?—I am very interested in his claim to have discovered a “very large, but previously-unrecognised, Late Hellenistic, Roman-period, and later, settlement” between Magdala and Kibbutz Ginosar. He suggests that the site may be the Dalmanutha of Mark 8:10. Because the parallel account in Matthew 15:38–16:1 has “vicinity of Magadan,” some scholars believe that Dalmanutha was another name for Magadan/Magdala. Mendel Nun has proposed that Dalmanutha be identified with a small anchorage north of Magdala (Anchor Bible Dictionary 2:4). Dalmanutha may not be a proper name but simply the Aramaic word for harbor. You can read the lecture summaries and see the bibliographic details at the blog of the Centre for the Study of Christian Origins. Plain of Gennesaret (Ginosar) from Arbel. Is this the region of Dalmanutha? Sidon is set to have its own national museum on site a leading archaeological dig, with donors and developers ready to sign a contract for its construction Monday.The museum project will be built on land owned by the Directorate General of Antiquities at the Frère site. The British Museum has been conducting excavations at the Frère site for the past 14 years, and it is considered one of the most important archaeological digs in the region. The museum will house archaeological finds that demonstrate the contribution of various civilizations to the city of Sidon. Excavations at the site have shed light on the city’s history, and the remnants discovered date back as far as 4000 B.C., according to the head of the British Museum expedition, Claude Doumit Sarhal. “The artifacts provide insight into historical phases of the city and highlight the importance of the Mediterranean civilizations and cities in communicating with other civilizations,” she said. The full article provides more details. Sidon is mentioned 20 times in the Old Testament, most frequently as an object of condemnation in the prophets. In the New Testament, both Jesus and Paul visited the city (Matt 15:21; Acts 27:3). One of the most important sites from biblical times is neglected and deteriorating today. Samaria, the third and most significant capital of the kingdom of Israel, is prey to looters and vandals, as reported in yesterday in an article by the Associated Press. "Sebastia, the archaeological site, is abandoned without any control from 2000. It's 13 years," said Osama Hamdan, a Palestinian architect who has coordinated the restoration works of Crusader-era buildings with [Carla] Benelli. "A lot of destruction of cultural heritage in this area has happened." He said statues, vases, coins and glasses have all been taken by looters. Weeds grow freely among the archaeological ruins, sticking out from the ancient stones. Plastic bottles and food bags are littered at the bottom of the staircase that leads to a Crusader cathedral - also site of a mosque - where the tomb of John the Baptist is said to be located in the village of Sebastia. Finely decorated stone Roman tombs in the center of the village are smashed and abandoned. At a Byzantine church dedicated to John the Baptist, located in the Israeli-controlled part, graffiti hailing the Hamas militant group is spray-painted on a column. The Islamic expression of faith - "There is no god but God" - is written in Arabic over the entrance. The Israel Museum has created a virtual tour of the Herod the Great exhibit in which you can “walk” through the nine galleries, viewing the reconstructions, listening to audio explanations, and watching several video pieces. The gallery is loosely arranged after the journey of Herod from the place of his death in Jericho to his burial at Herodium. Herod’s relationship with Rome is featured, and Ehud Netzer is honored. A photo of the reconstruction of upper and lower Herodium is valuable. Herod’s Buildings in Jerusalem provides some excellent footage from the Jerusalem model now on the grounds of the Israel museum. This video could be used effectively in the classroom. A time-lapse video of the reconstruction of the upper story of Herod’s mausoleum reveals just how much work was involved in this museum exhibit. The Herod exhibition has been extended to January 4, 2014. Greek inscription mentioning donation for Herod’s temple in Jerusalem, 21 BC. Now on display in the Hecht Museum, Haifa.